This past weekend was my favorite kind of weekend. The one I have desperately been needing in my life. Friday night was a get together with friends that included delicious drinks, followed by a long, 2-bottle of wine dinner in the Mission. Saturday morning was lazy and loungy around the breakfast table, girlie pampering, and a coffee/city walk with a great friend who was in town for the weekend. Saturday night we went out again to celebrate a friend’s birthday. And Sunday, glorious Sunday, started with some steel cut oatmeal with FRESH figs and honey, my weekly farmer’s market stroll, and a 4 hour-long get together with friends at Zeitgeist on possibly the most gorgeous summer day we’ve had in weeks. I often catch myself thinking about how fortunate I am to have my family and friends, to be just weeks away from marrying the person I feel 100% certain is my soul mate, and for being able to actually try to wrap my head around these things…August marks an important time in my life, and an important time in this blog’s life. It was last August when I decided that I would devote a significant amount of time to this place. I would post an average of three times per week. I would give eating/sf a face lift. I would commit to creating a banner. I’m pretty proud of how much I’ve blogged since. I’m only a few posts away from the big 200. I’ll try to save something extra special to share with you to celebrate. In the meantime, I hope you bought some corn this weekend–at your grocery store, your farmer’s market, or from the side of a road somewhere. Corn gets a lot of slack these days but I have to admit that I love corn. The way it can be microwaved, boiled, thrown on the grill, eaten off of the cob, in the form of a soup–or a kernel salad. It’s juicy, sweet, crunchy. It will inevitably get stuck in your teeth. I found this recipe for a ‘hash’ of sorts in my Alice Waters’ cookbook, and have made it twice now. Both times, I’ve adapted the recipe to include some gorgeous sweet Italian peppers that I’ve been picking up at the market into the mix. The first time I made this hash, I made it without the jalapeno, and topped with parsley. The second try included the jalapeno and basil instead of parsley. This is a fantastically versatile recipe. Throw in any peppers you have on hand (chopped into bite sized pieces). Skip the hot pepper, or up the ante. Throw in cilantro. Whatever you do, make sure to give it a very good squeeze of lime. 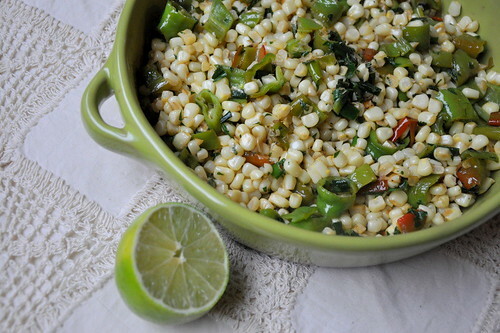 The lime really plays up the sweetness of the corn and adds a citrusy/salty Mexican flair to the dish. We served it warm, and I feel that it’s probably best that way, but if you’re headed to an end of summer picnic or BBQ, don’t worry about turning it into a cold salad. 1. Cut the kernels off each ear of corn and place the kernels into a bowl. 2. Heat the butter in a large skillet over medium heat. 3. Add in the onion and jalapeno pepper (if using) and cook for about 4-5 minutes, letting the onion soften (but not brown). 4. Add in the sweet peppers, cooking for another couple of minutes. 5. Sprinkle in some salt, turn the heat up just a notch and add in the corn kernels, tossing them around to combine all of the ingredients. 6. Cook for only a few minutes before squeezing in the lime, and adding in the herbs. Salt and pepper, to taste and squeeze in more lime juice, to taste. I like this hash to be pretty limey–it elevates the flavor of the hash and pairs beautifully with fish, shrimp, and flank steak. Serve it warm. 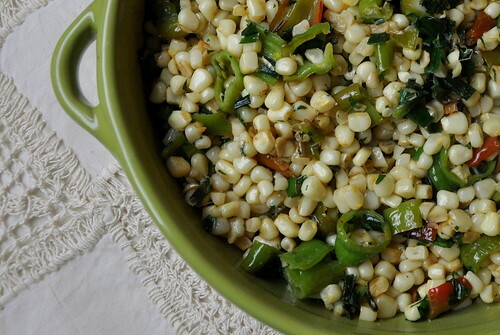 This entry was posted in Alice Waters, corn, food music blog, lime, Musical Pairings, pepper, recipes, side, summer. Bookmark the permalink. That sounds so good. Corn is one of my favorite foods, why is it getting slack these days? Jeremy- mine too! I'm reading the Omnivore's Dilemma now, and at the center of the debate is corn. Really fascinating read and a whole new way of looking at this staple food. Oh yes, I did read that though I think he's talking about the industrial corn that you can't even really eat. That stuff's got issues, but I say keep the good stuff coming!